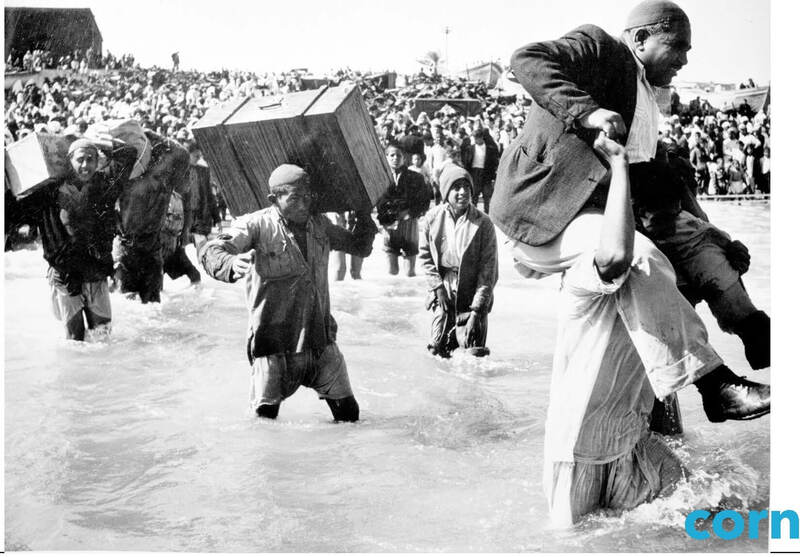 The UN agency that deals with Palestinian refugees has opened a new digital archive including many images from the Nakba, the Palestinian catastrophe of 1948, when 750,000 Palestinians were expelled by or fled the Zionist army and militias when the state of Israel was established in Palestine. 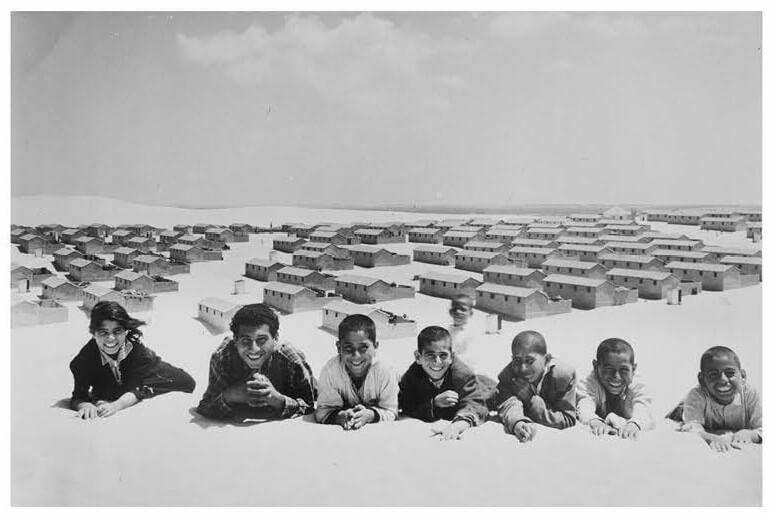 And Alwan for the Arts in New York and UNRWA USA are honoring the archive with an exhibition in New York of iconic photographs from 1948 through to the present day. The exhibit opens today downtown and will run for three weeks, culminating in an auction of photos on the night of Thursday February 12. The exhibition is called “The Long Journey,” and you can see it for free any afternoon during the week from 2-5. The press release is below. Here is a preview of some of these wrenching photos, which will some day be inscribed in American consciousness the way that photos of the Jewish experience of eastern Europe are. This one is very famous. We often hear the words “forced into the sea” — these people had that experience. The children’s photo at the top of this post is reminiscent in its beauty and innocence of Annemarie Jacir’s great movie, When I Saw You, about militant refugees in Jordan. Is it any surprise that many of these young people became radicalized, and built their lives around the idea of getting their homes and country back? UNRWA USA, in partnership with Alwan for the Arts, presents “The Long Journey,” a collection of historical photographs (1948-2014) from the Archives of the UN Relief and Works Agency for Palestine Refugees, recently exhibited at the UN Headquarters. 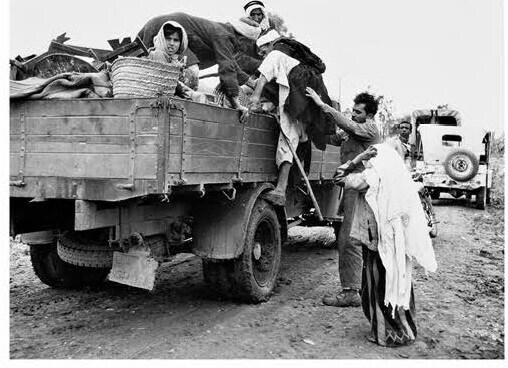 The Long Journey is an exhibition that recounts the life and history of the Palestine refugees since 1948 through a selection of iconic pictures and films from the United Nations Relief and Works Agency for Palestine Refugees in the Near East (UNRWA)’s archives. The exhibition draws public attention on human stories and the works of UNRWA in the Middle East. In this exhibit, UNRWA unveils the first part of its newly digitized archive, which consists of over half a million negatives, prints, slides, films and videocassettes covering all aspects of the life and history of Palestine refugees from 1948 to the present day. The first group of iconic photographs are part of the exhibition, The Long Journey, which opens on 23 January, 2015, at Alwan for the Arts in Lower Manhattan. UNRWA’s archive has been inscribed on the UNESCO ‘Memory of the World’ register, which includes collections of outstanding cultural and historical significance. 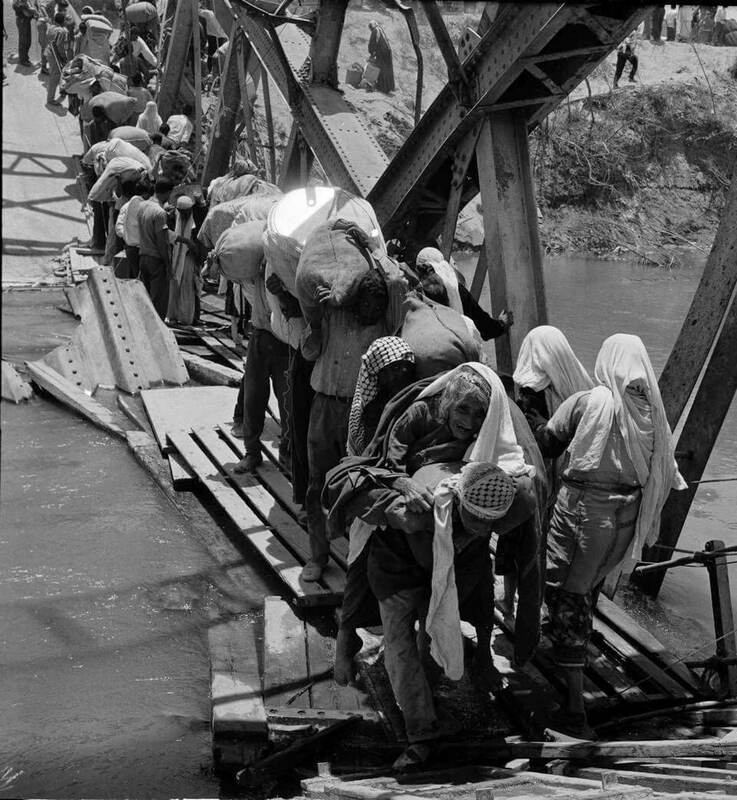 In tandem with the digitized archive, UNRWA is also launching a website,http://archive.unrwa.org/, where the 1,948 images will be available to media, academics, writers and others who wish to study, explore or just have a window into the world of Palestine refugees from 1948 to the present day. The Long Journey is organized and endorsed by UNRWA USA. The following video “The Long Journey” records Lebanese photographer and filmmaker George Nehmeh, whose iconic footage and photography from Palestine, Jordan and Lebanon working for UNRWA from the 60’s through the 90’s is displayed in this exhibit, as he retraces his steps years later.